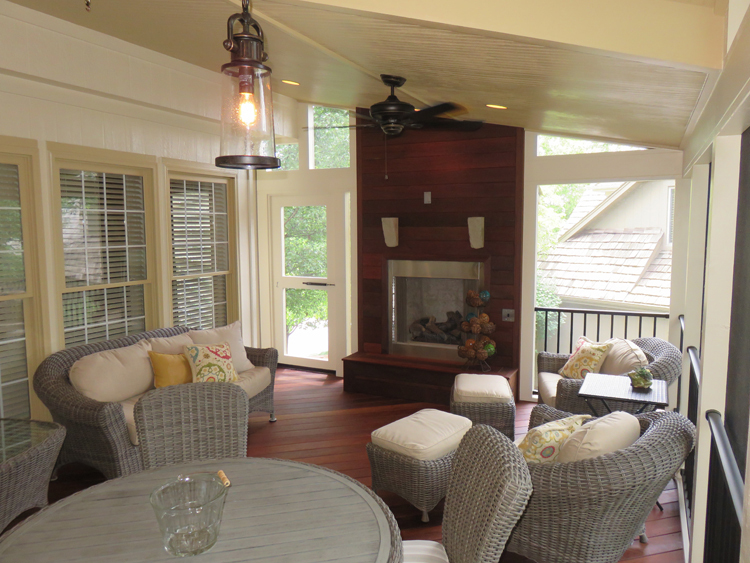 Is a fireplace right for my Kansas City screened porch? We are very lucky in Kansas City to have four distinct, beautiful seasons each year. Three of them are delightful to enjoy from the comfort of a screened porch, especially if you own a porch with a fireplace. Once the snow is on the ground, you’re better off relaxing inside. 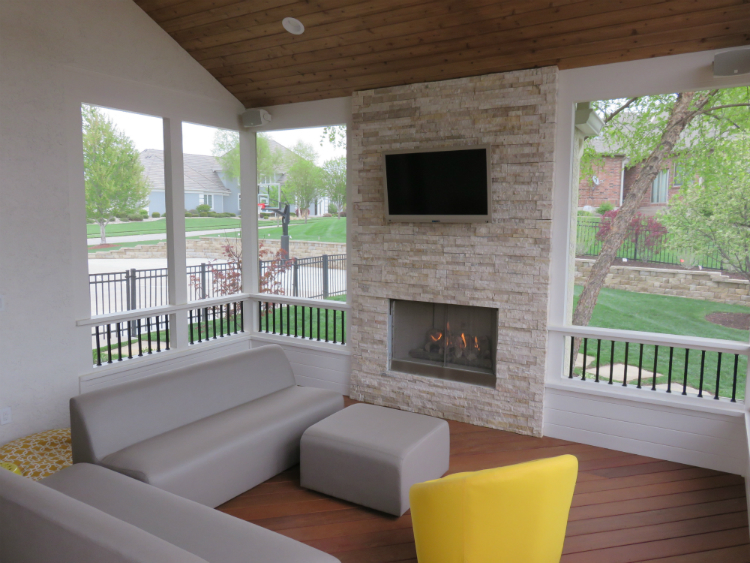 Understanding that a fireplace should offer you enough warmth to extend your use of your porch earlier in the spring and later in the fall, there are some practical considerations in making the decision to include one in your plans. First, of course, is price. 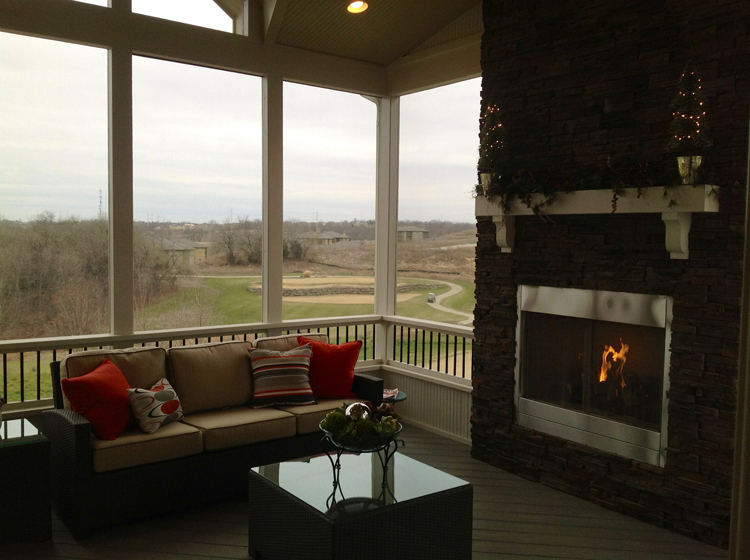 A gas fireplace on an open or screened porch could cost between $7,000-$10,000. It may also “cost” you a piece of one wall as far as real estate on your porch. If you have one side of your porch where you want extra privacy or you don’t mind obscuring the view, no problem. If you value a 180-degree panorama outlook, this might be too high a price to pay. These homeowners had their fireplace strategically placed to create a privacy wall leaving room for a view of the beautiful backyard and street. As with any other building project, there are also design choices. Do you prefer wood or natural gas? Most of our customers prefer gas fireplaces because they are cheaper to build and maintain, have fewer building code restrictions and are easier to use and manage. If you already have a gas line coming to your home, that reduces the expense further. With either choice, you get the heat and ambiance that make fireplaces so attractive and add value to your home. During our design consultation, we also discuss your preferences in trim style for the fireplace. Do you prefer wood, stone, granite, brick? Wood is almost always the least expensive choice, but we have some exotic wood and inlay options that are very distinctive and come in at a higher price point. Ipe is a South American hardwood that has a dark red color and makes for a very striking facade. Some customers use a combination of materials, say wood and stone, to create a unique look for their fireplace. The next question is what would you like to see above or below your fireplace? Some people are more traditional and like a hearth and a mantelpiece. These are options, but aren’t required. Homeowners with a more modern style often choose something more sleek and streamlined in its design. Nooks for flat screen TVs over the fireplace are very useful and popular. This entry was posted in Outdoor fireplace, Porch amenities on September 30, 2014 by archadeckkansascity.